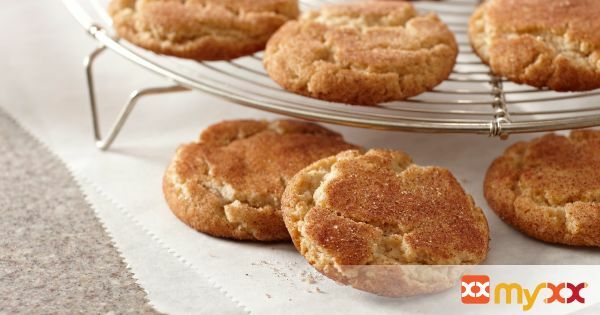 Dress up the basic sugar cookie with a double dose of warm cinnamon spice. 1. Mix flour, 2 teaspoons of the cinnamon, cream of tartar, baking soda and salt in medium bowl. Set aside. Beat 1 1/2 cups of the sugar and butter in large bowl with electric mixer on medium speed until light and fluffy. Add eggs and vanilla; mix well. Gradually beat in flour mixture on low speed until well mixed. Refrigerate 2 hours or until firm. 2. Preheat oven to 400°F. Mix remaining 1/4 cup sugar and remaining 1 tablespoon cinnamon in small bowl. Shape dough into 1-inch balls. Roll in cinnamon sugar mixture to coat. Place 2 inches apart on baking sheets. 3. Bake 6 to 8 minutes or until lightly browned. Cool on baking sheets 1 minute. Remove to wire racks; cool completely.